Crush your enemies, climb the tower of paperwork -- or do both at the same time. Intel's Core 2 Quad Q8300 not only makes it possible, it makes it easy. The Core 2 Quad Q8300 has four cores that run at 2.5GHz and shares 4MB of L2 cache. Quad cores means true multi-tasking and multi-threading. Tasks or threads get their own core; no more sharing one core and set of clock cycles. This lets you turn your system into the ultimate home entertainment center PC. One core handles the usual action on your operating system, while the second can play a DVD on the TV, the third download a file from internet, and the fourth one sends audio to the kids in another room with no lags or stutters. All this is made easier with Intel’s advanced Digital Media Boost. The 45nm Intel Core 2 Quad processor is armed with Intel HD Boost, which implementing new Intel Streaming SIMD Extension 4.1 (Intel SSE4.1) instructions for fast high definition video editing and encoding, enhance the multimedia performance. 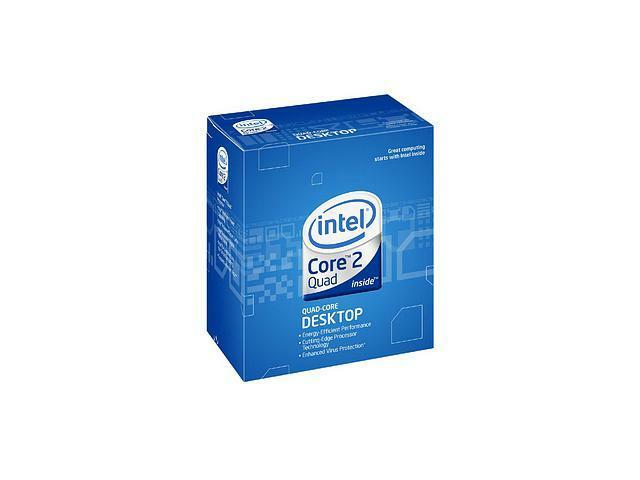 Intel Core 2 Quad-core Processor With four processing cores, the multitasking monster Quad-Core Intel Core 2 processor delivers fourfold the performance on highly-threaded applications, taking your desktop PC experience into a completely new realm of mega power. The powerful processor delivers serious performance on the ultra-demanding games of today and tomorrow. The innovative 45nm quad-core technology optimizes thermal performance for reduced power consumption and noise. Intel Advanced Smart Cache Intel Advanced Smart Cache Technology dynamically allocates the shared L2 cache to each processor core based on workload. This efficient, multi-core-optimized implementation increases the probability that each core can access data from fast L2 cache, resulting in significantly reduced latency for frequently used data and improved performance. Intel Wide Dynamic Execution With Intel Wide Dynamic Execution, each of the four cores can complete up to four full instructions simultaneously to improve execution speed and efficiency, delivering more instructions per clock cycle. Enhanced Intel SpeedStep Technology (EIST) EIST allows the system to dynamically adjust processor voltage and core frequency to decrease average power consumption and average heat production. Combined with existing power saving features, EIST may provide an excellent balance between providing power when you need it and conserving power when you don’t. This item is covered by E.O.L. Tech Inc. Return Policy. Pros: It's good, it works still, I can't say I have put it to it's limits, wherever they are. The CPU is a work horse and continues plowing the field. Nvidia with Intel, in terms of CPU/GPU combinations. Pros: Good, solid performer, although obviously nowhere near the performance (or price!) of a 9 series. Clocked to 3.52 GHZ stable (55C load), which is apparently pretty high for this processor. Guess I got a good one. See other comments for how I got to 3.52. Other Thoughts: For those of you who want to know how I got to 3.52, i'm running a Gigabyte GA-EP45-UD3P ver 1.6 on the latest stable BIOS (cant remember off the top of my head). Clock control at 470, multi at 7.5, and i'll leave the rest up to you :) hint: bumped vcore and nb a couple notches. Also with OCZ Gold DDR2-800 2x2 (2.1v) and a Xigmatek S1283. Pros: Runs fast. It may not be the fastest processor on the market, but for the price, I love how the 4 individual cores allow me to either run up to four separate apps without slowing me down, or pack all of that power into one highly CPU intensive application (simulation) to get the job done faster. Windows 7 handles all of this perfectly. Cons: The motherboard/heatsink mouting design is the worst I've ever encountered...took me several tries to get it mounted, and I've mounted several CPUs over the years. Pros: Noticeably faster than the piece of rubbish I had slammed onto the motherboard that used to occupy my computer. Way cheaper than an i5 and given the fact that I didn't have the money to blow on a brand new motherboard and fancy DDR3 RAM, super cost-effective insofar as an upgrade path was concerned. Other Thoughts: Compared to the Pentium Dually that was in my machine before it, it runs super fast. Also, for some reason, was not compatible with the Intel motherboard I was using. Ended up buying a new motherboard later on down the road and never looked back. Overall, pretty glad I made the purchase, and would do so again to build out a server or some such nonsense. Pros: Even cheaper now than when I first purchased it. Fast for a budget build. Cons: Nowadays there are better options. Other Thoughts: Used this in my last build, and as a budget card (now), you still can't go wrong. Combined with a P35 motherboard, 4GB of DDR2 800 and an eVGA GTX 260, I never had any issues with BC2, CoD4, Civ5 or even Shogun 2. Pros: The difference I had between this and my dual core was almost night and day. Runs everything so far flawlessly (SC2, Rift, DA2, ME2, etc. ), the only thing limiting from going to max is my video card! Cons: Didn't come with any Thermal Paste, but that's not a big deal. Other Thoughts: Great for the price, and futureproof if your mobo is stuck on Core 2 processors.